The Grand Traverse County Commissioners listen to public comment at their meeting on Feb. 7th. The Grand Traverse County Commission hear the first prayer following approval of the invocation policy. An expert says there may be a legal challenge to the decision. On Wednesday morning, a room of about fifty people quiets down as Chair Rob Hentschel calls the meeting to order. This week it is Hentschel’s turn to start the invocation. He hands over his time to local Pastor Brian Conover. Prayers like this could happen at each County Commission meeting. Board members decide if they want to pray or nominate someone else to do it. If a community member wants to give an invocation, they have to email the commissioners. Only one prayer is given per meeting, but Hentschel says there are no restrictions on who can speak or what they say. Hentschel says this policy shouldn’t be controversial because no one is forced to participate. Commissioners like Betsy Coffia, who oppose the policy, could take a different tact. In 2014, the U.S. Supreme Court ruled that religious prayer at government meetings is allowed as long as non-believers aren’t shamed or coerced into participating. But some experts say determining that is a bit tricky. Frank Ravitch is a religious law professor at Michigan State University. He says people in Grand Traverse County may feel pressured to pray. Ravitch says there is also a chance members of the public will feel they are being discriminated against. He says if someone asks commissioners to give a prayer and they are not chosen, that could open the county up to a lawsuit. Ravitch says other communities that introduced similar policies have been sued and racked up millions of dollars in legal fees. He says they’ve also lost businesses and faced public blowback. “If really what they care about is solemnizing the event, and people having a moment to really reflect and come together … a moment of silence serves that purpose with no legal risk,” Ravitch says. Barb Willing supports the invocation. She says it brings levity to the start of the meetings. Because different commissioners choose what invocation will be read at each meeting, the next one could be different. There could be a humanist invocation, a Buddhist prayer or there could be no words spoken at all. The Grand Traverse County Board of Commissioners approved two controversial policies today during a meeting that lasted seven hours. 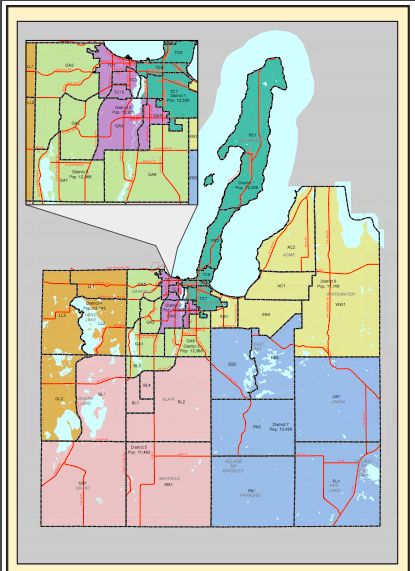 Two Democrats will be joining the Grand Traverse County Commission in January. The commission has historically been dominated by Republicans. Bryce Hundley and Betsy Coffia were the two Democratic winners. Coffia says Democrats had a strong showing in races across the county. "I think you're seeing a community that is really motivated for that change," Coffia says. "It takes a lot of work, but I do believe we're moving in that direction, in a more progressive direction."